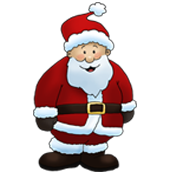 Santa's Website is an imaginative website which children of all ages can enjoy. With help from Santa himself, we have created what is considered to be the top Christmas website on the internet today, where you can interact with all of Santa’s reindeer and his elves. Reindeer on the Roof has fast become a cherished Christmas tradition! Children fill out their Christmas List and place it into the reindeer’s saddlebag. When the children are asleep, the Reindeer will fly to the North Pole to deliver the child’s Christmas List directly to Santa Claus.